Nutrition involves an interaction between food and the living organism. A nutrient is a substance that the body uses to maintain health. A balanced diet contains all the essential nutrients and includes a variety of foods, proportioned as shown in Figure 15.12. Following digestion, nutrients enter the blood in the cardiovascular system, which distributes them to the tissues, where they are utilized by the body’s cells. Mitochondria use glucose to produce a constant supply of ATP for the cell. In other words, glucose is the body’s immediate energy source. Because the brain’s only source of energy is glucose, it needs a constant supply. The liver is able to chemically alter ingested fats to suit the body’s needs, with the exception of linoleic acid, a fatty acid the liver is unable to produce. Since linoleic acid is required for construction of plasma membranes, it is considered an essential fatty acid. 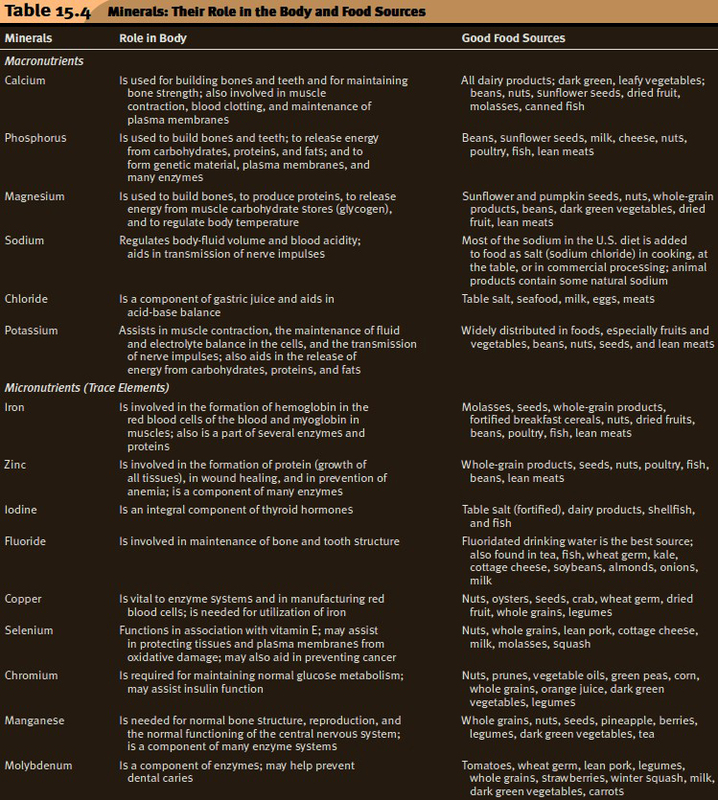 Essential molecules must be present in food because the body is unable to manufacture them. Still, saturated fats should be restricted. If glucose is not available, fats can be metabolized into their components, which are then used as an energy source. Therefore, fats are said to be a long-term energy source. When adipose tissue cells store fats, the body increases in weight. Cells have the capability of converting excess sugar molecules into fats for storage, which accounts for the fact that carbohydrates can also contribute to weight gain. Amino acids from protein digestion are used by the cells to construct their own proteins, including the enzymes that carry out metabolism. Protein formation requires 20 different types of amino acids. Of these, nine are required in the diet because the body is unable to produce them. These are termed the essential amino acids. The body produces the other amino acids by simply transforming one type into another type. Some protein sources, such as meat, are complete in the sense that they provide all the different types of amino acids. Vegetables supply the body with amino acids, but they are incomplete sources because at least one of the essential amino acids is absent. A combination of certain vegetables, however, can provide all of the essential amino acids. Figure 15.12 Food guide pyramids. a. The U.S. Department of Agriculture uses this pyramid, which emphasizes the importance of including grains, fruits, and vegetables in the diet. According to this diet, meats and dairy products are needed in limited amounts; fats, oils, and sweets should be used sparingly. b. A new pyramid suggested by nutritionists at Harvard Medical School differs from the pyramid shown in (a) by recommending the inclusion of certain oils in the diet and the restriction of certain carbohydrates. Over the past 20 years, numerous statistical studies have been done to determine whether a diet rich in fruits and vegetables protects against cancer. The vitamins C and E and beta-carotene, which is converted to vitamin A in the body, are especially abundant in fruits and vegetables and seem to have a special function in cells. Cellular metabolism generates free radicals, unstable molecules that can attack and damage other molecules, such as DNA, proteins (e.g., an enzyme), carbohydrates, and lipids, that are found in plasma membranes. The damage to these cellular molecules may lead to disorders, perhaps even cancer. In addition, plaque formation in arteries may begin when arterial linings are injured by damaged cholesterol molecules. Certain minerals form the structure of metalloenzymes, which serve as antioxidants. Glutathione peroxidase, a major intracellular antioxidant, contains the mineral selenium in its structure. Superoxide dismutase, another antioxidant enzyme, contains either magnesium or copper and iron. Dietary supplements may provide a potential safeguard against cancer and cardiovascular disease, but taking supplements instead of improving your intake of fruits and vegetables is not the solution. Fruits and vegetables provide hundreds of beneficial compounds that cannot be obtained from a vitamin pill. These beneficial compounds include flavonoids and plant phenolics such as those found in red wine. These substances enhance each other’s absorption or action and perform independent biological functions. Vitamins are vital to life because they play essential roles in cellular metabolism. Because the body is unable to produce them, vitamins must be present in the diet. Vitamins are organic molecules, but they differ radically from carbohydrates, fats, and proteins. They are much smaller in size and are not broken down to be used as building blocks or as a source of energy. Instead, the body protects them and provides many of them with protein carriers that transport them in the blood to the cells. In the cells, vitamins become helpers in metabolic processes that break down or synthesize other organic molecules. Because vitamins can be used over and over again, they are required in very small amounts only. Vitamins fall into two groups: fat-soluble vitamins (vitamins A, D, E, and K) and water-soluble vitamins (the Bcomplex vitamins and vitamin C) (Table 15.3). Most of the water-soluble vitamins are coenzymes, or enzyme helpers, that help speed up specific reactions. The functions of the fatsoluble vitamins are more specialized. Vitamin A, is used to synthesize the visual pigments. Vitamin D is needed to produce a hormone that regulates calcium and phosphorus metabolism. Vitamin E, is an antioxidant. Vitamin K is required to form prothrombin, a substance necessary for normal blood clotting. In contrast to vitamins, minerals are inorganic elements (Table 15.4). An element, you will recall, is one of the basic substances of matter that cannot be broken down further into simpler substances. Minerals sometimes occur as a single atom, in contrast to vitamins, which contain many atoms, and carbohydrates, such as starch, which contain thousands of atoms. Minerals cannot lose their identity, no matter how they are handled. Because they are indestructible, no special precautions are needed to preserve them when cooking. Minerals are divided into macronutrients, which are needed in gram amounts per day, and micronutrients (trace elements), which are needed in only microgram amounts per day. The macronutrients sodium, magnesium, phosphorus, chlorine, potassium, and calcium serve as constituents of cells and body fluids, and as structural components of tissues. 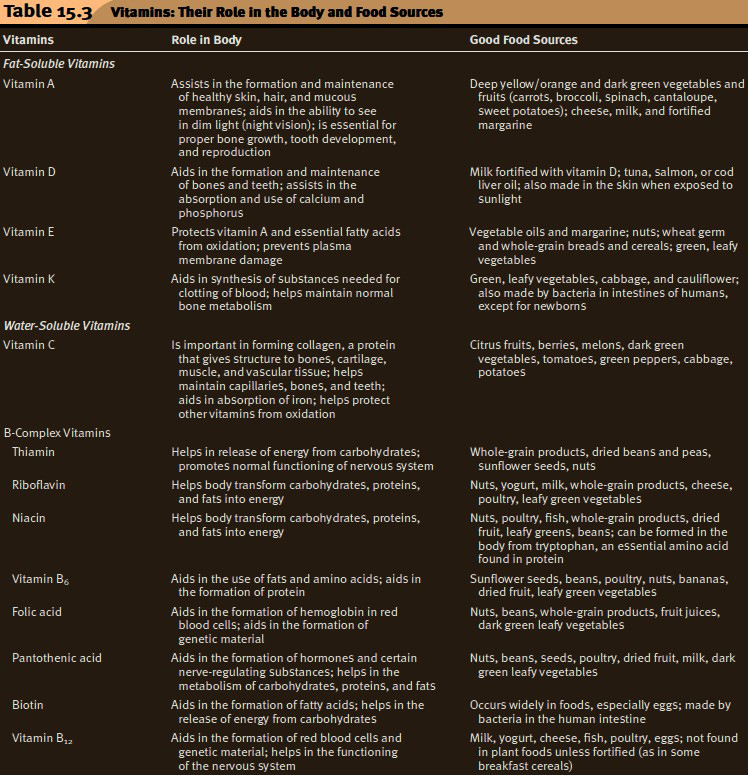 The micronutrients have very specific functions, as noted in Table 15.4. As research continues, more elements will be added to the list of those considered essential.